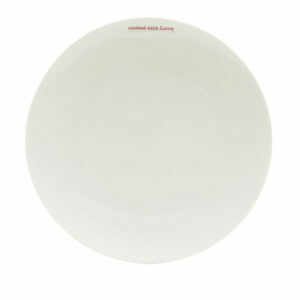 Enjoy any meal with this adorable large plate designed by Keith Brymer Jones in the UK. This plate is crafted from the finest quality super white porcelain which is hand stamped with the word “bon appétit” in a beautiful contrasting lilac blush. Do as the French do with this cute “bon appétit” large plate crafted from the finest super white porcelain which is hand stamped using a vintage typewriter font in a vibrant lilac blush. Keith Brymer Jones has 30 years of ceramic design under his belt. Keith has always been passionate about ceramics, he started his career working for Hartfield potter when he was 18. A few years later he got his own studio in Highgate which is where he started to develop the Word Range. Now Keith is head of design at MAKE International where he collaborates with numerous designers to create beautiful collections of original ceramics. All products in the Word Range are microwave and dishwasher safe, making them stylish and practical for any modern home.